Last Tuesday saw former President Trump attorney Michael Cohen plead guilty to eight felony charges in federal court, and former Candidate Trump campaign chair Paul Manafort separately convicted of eight federal felonies of his own. Prominent Republican US Senators were keeping mum on the news. Some have construed their silence as fear of the President. More likely, it’s GOP leader Mitch McConnell measuring the bus’s clearance to make sure Donald Trump can be slid well underneath it in 2019. Since the 2016 election, President Trump has seized control of much of the GOP’s grassroots by kicking traditional conservatives off the land. Arizona Senator Jeff Flake has unashamedly sung choruses of “It’s My Republican Party and I’ll Cry if I Want To”, but he and his most outspoken allies, like many of those running for re-election this November, don't have skin in the game. Many of his GOP seatmates are more concerned with self-preservation and don’t want to be primaried into retirement. But don’t mistake silence for contentment. The GOP Establishment doesn’t like Trump’s tariffs. They don’t like his bullying tweets. They don’t like his clumsiness on the world stage. They don’t like his negative effect on the legislative process. They needed Vivien Leigh in the White House, and they got Stormy Daniels. And they can’t stop it today. 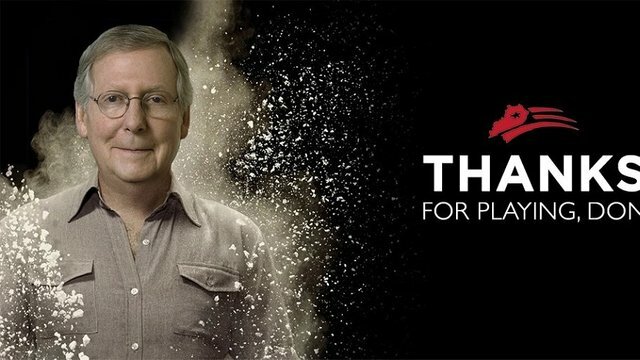 Nobody plays the long game as well as McConnell. He doesn’t always win (remember that bit about making Obama a one-term President?) but he is generally patient enough to let other people make mistakes and pounce later on. Pounce years later, if necessary, such as when he used prior majority leader Harry Reid’s “Majority Rules!” move to deny Judge Merrick Garland a Supreme Court confirmation hearing. Say as little as possible before the midterms. Concentrate on trying to hold the Senate. Don’t make the President the issue by condemning or defending him. Try to localize races; nationally, run on low unemployment. Watch the Dems seize the House. Hope the Dems don’t get all sweaty about Impeachment in January. Encourage cooler heads across the aisle to hold a few months of hearings first. Michael Cohen would likely appreciate a few days’ break from prison lunches. Mariia Butina wants to go home sooner rather than later. Sam Nunberg is a chatty chap. Omarosa’s likely bitter that Manafort and Cohen mercifully short-circuited her never-ending news cycle. For the other witnesses, the subpoena power, now in Democrat's hands, is a powerful thing. Watch Articles of Impeachment rumble through the House over summer 2019. Call a meeting of GOP Senators, and remind them that if Trump goes, Nancy Pelosi doesn’t become President. Vice-President Mike Pence does. Good ol’ Mike, who’s an actual conservative. Put a grown-up in the White House. Stand a puncher’s chance in 2020. Remember last year’s bun fight between Trump and McConnell? He who laughs last, laughs longest. The Never-Trumpers have a knee-slapper coming. The set-up will take a little time.